Configure the viewer to load specific computers. This simple and easy-to-follow guide will assist you in properly setting up and configuring your NetVizor for centralized logging over multiple subnets on your network. Open the NetVizor Viewer software and click on the "Computer Management" menu, then "Add Computer" - "Add Computer(s) to Viewer...". 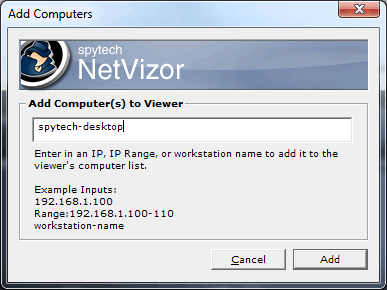 Enter the name or IP address of the computer you want to have the NetVizor Viewer load, clicking "Add" to add the computer to the viewer list. Click "Refresh All" to have the Viewer load the new computers. Have any questions? Please contact us here.